The user friendly HandShoe Mouse is an ergonomic mouse available in 3 standard sizes: Small, Medium and Large. The HandShoe Mouse is plug and play; no special software drivers for Mac or PC are needed. Controls consist of 2 buttons at an ergonomic position and a scroll wheel fitted with a switch mechanism. The large size HandShoe Mouse has a third mouse button. This mouse button is not programmable; it has the same function as the click function underneath the scroll wheel. You can also order a BlueRay Track (BRT) version of the HandShoe Mouse which will work on almost every surface. The BRT version works with a higher resolution than the standard: 1000 dpi. The BRT Light Click (LC) version: has a resolution of 1500 dpi. Receiver/dongle of standard BRT version is fitted with a LED light which goes on and off when operating the mouse. Receiver/dongle of BRT Light Click (LC) version is smaller and does't have a light. The wireless HandShoeMouse uses a lithium ion battery which can only be removed by professional service providers only. Battery life is approximately 2 years. One can continue working while charging the battery; the micro receiver/dongle must be in place. HandShoe Mouse is the best ergonomic mouse in the world. The HandShoe Mouse has been developed by a Dutch medical university and has been tested in large organizations for almost two years. During these tests we saw many people who were suffering from RSI or Carpal Tunnel Syndrome, coming back to work again. The reason is that the unique and patented shape of the HandShoe Mouse fully supports your hand in the best relaxed position and prevents gripping and pinching, what you do when you use a standard mouse. However excellent the functionality of the standard computer mouse - we all use it with great ease - most of the time it is too small for the hand while its shape forces your hand and fingers in an unnatural gripping position. It lacks comfort and the gripping and pinching, as well as the hovering of your fingers above the mouse buttons are the major sources of complaints which may lead to Repetitive Strain Injury (RSI) or Carpal Tunnel Syndrome. The Research team has also tested a vertical mouse and found that gripping and pinching of a vertical mouse is still a potential source of RSI or Carpal Tunnel Syndrome. Another medical university found that with a vertical mouse the "interosseous membrane" is extremely taut ("stressed") which also may lead to complaints. Instead of over-using your hand and wrist, your arm will most of the time let the optical HandShoe Mouse float without any effort. The shape allows for the hand to continuously rest on the mouse body in a relaxed fashion, so there is no skin contact between your hand and the desk. As a result there is no skin irritation as caused by excessive rubbing when moving a conventional mouse. Contrary to conventional computer mice you don't have to continuously lift (hover) the fingers, to prevent accidental switching. HandShoe = "Glove". In Dutch the word HandShoe means "Glove". The HandShoe Mouse "fits like a glove" or, like some people say "feels like a saddle for the hand". The HandShoe Mouse is available in three standard sizes (Small, Medium and Large) which are available in a wireless and a wired version. So size matters and there is a HandShoe Mouse for everyone. The HandShoe Mouse is developed, based on proper university research and measurements and not on beliefs of individuals. Do you feel pins and needles in fingers, loss of sensation and even burning pain? This may be the result of the awkward bent position your hand is forced into, when working with a mouse that does not give full support. You then get excessive pressure on the Median and Ulnar Nerve. With a mouse that doesn't fully supports your hand, like a standard mouse or a vertical mouse, you run the risk of Carpal Tunnel Syndrome or Guyon’s Canal Syndrome. Two separate parts of the hand can be affected, little and ring finger and the remaining part of the hand. The full support by the HandShoe Mouse helps to prevent this. "Reaching for your mouse" without the support of your forearm, or using a mouse that doesn't fully supports your hand, forces your wrist in an awkward bent position which may lead to serious neural effects. 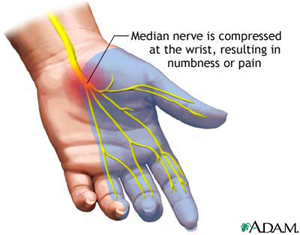 Let’s explain: Excessive pressure on the median and ulnar nerves, which control your hand and fingers, will first be noticed by a feeling of pins and needles in the fingers, followed by loss of sensation and even burning pain. This is generally called carpal tunnel syndrome. Two separate parts of the hand can be affected: pinky plus ring finger and the remaining part of the hand. Special attention should be paid to support the pinky side of the hand which is served by the more exposed ulnar nerve which runs through a separate tunnel. A minute bone, the pisiform, acts like a protecting shield. So if you push your hand on the desk and force it in a gripping, claw-like position, you stand a good chance to experience pins and needles and the burning pain. Working from the wrist and pressing down on the desktop can increase this risk. The special shape of the HandShoe Mouse provides full support of the hand and fingers to prevent these complaints. The Dutch medical Erasmus university developed the HandShoe Mouse especially to prevent people getting Carpal Tunnel Syndrome and Repetitive Strain Injury. More Research information can be found on the Research Page. Recently a new standard was set with the Light Click buttons of the HandShoe Mouse which also helps people who are already suffering from Carpal Tunnel Syndrome or RSI. In the past decade, the use of computers has exploded and today you'll find computers in every company or organization and in a fast growing percentage for private use at home. Today it has also become clear from dedicated research, that almost one in six office workers are suffering from Musculoskeletal Disorders (MSD), including Repetitive Strain Injury (RSI) and Carpal Tunnel Syndrome. Research has proven that a lot of these complaints are related to the use of a conventional, standard computer mouse. The Erasmus University Medical Center in the Netherlands has clearly identified these problems and has also spent several years to design and test in the field, the best and most comfortable ergonomic mouse. On this website you'll find the research background information for the ergonomic mouse, the proof of the studies by means of electromyogram (EMG) measurements and the best solution for your hand: the HandShoe Mouse. 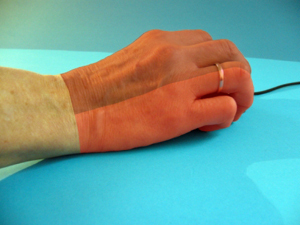 Studies performed by the Medical Center of Erasmus University in the Netherlands, have shown that physical complaints, as a result of the extensive use of a conventional computer mouse, were often related to excessive gripping and pinching of the mouse. 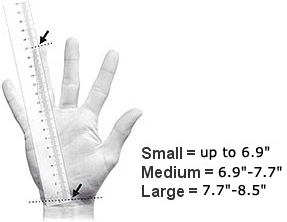 A standard computer mouse is simply too small for your hand, so you need to keep your hand and fingers in an unnatural gripping and pinching position to hold on to the mouse. This may lead to a reduction of the space between the first rib and the clavicular bone which could translate in pressure on nerves, arteries and veins and a restricted blood flow in your arms and hands. Complaints may also increase as a result of stress. 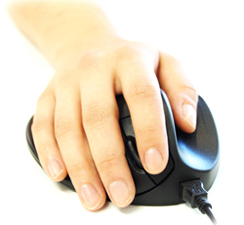 The Erasmus University studies have also shown that, when using a conventional computer mouse, you are obliged to almost continuously lift the fingers above the mouse to prevent inadvertent switching. This may lead to over exertion of certain muscles (the extensor muscles) in your arms and hands. As a result of this exertion, excessive tension in the deep neck muscles may occur. When these muscles are tense they can virtually close the costoclavicular gate between the first rib and the clavicular bone. Another aspect addressed by professor Van Zwieten of Hasselt University in Belgium is the highly intense use of fingers, for example with a conventional computer mouse. This may lead to hand- or finger complaints. To understand the finger positions concerned, we analyzed some of its joints by functional anatomical research. It appears that the functional demand of a stabilised arch of the finger will be met, by designing and using a computer mouse that is pre-shaped to prevent disorders caused by intense use of the mouse. In current e-learning practice, each student’s fingers, hand, and even whole upper extremity, may benefit from ergonomically safe working conditions, thus using the computer successfully. A statically and dynamically stabilized finger arch as is enabled by the HandShoe Mouse is needed to prevent complaints. 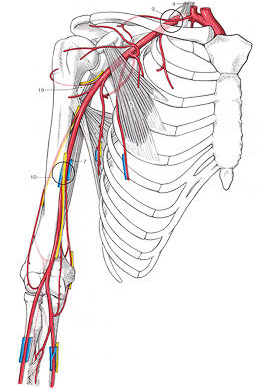 Blood vessels and nerves that pass through this gate may be pinched and the blood circulation may thus be hampered (possibly also resulting in carpal tunnel syndrome). When a (seated) person shifts his hand, palm downwards (fully pronated forearm), to and from his body, e.g. by moving a conventional computer mouse over a desk top, the Radius gradually crosses the Ulna. 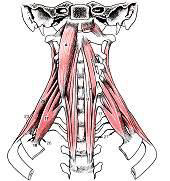 This is partially realised by contraction of the muscle Pronator Teres. Crossing of Radius over Ulna is defined as pronation of the forearm. Such frequent movements could result in Repetitive Strain Injury complaints. Next to the above subject, "pronation of the forearm", it is interesting to observe the behaviour of the membrane which sits between Ulna and Radius, the two forearm bones. For example, muscles of the forearm attach to this membrane. The membrane also transfers forces from the radius, to the ulna and to the humerus. In vitro studies by Professors K.J. van Zwieten, K.P.Schmidt et al, University of Hasselt demonstrated that the use of a vertical PC-mouse in “handshake” positions should be re-evaluated. 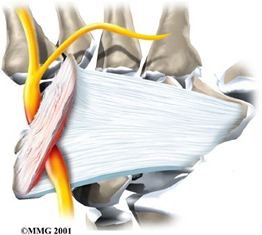 The so called neutral or “handshake” position results in a maximally taut membrane between Ulna and Radius. In general thumb and index finger long muscles originate from this forearm interosseous membrane. Therefore the need to grip and pinch a vertical mouse results in unnecessary strains in the already taut membrane and may cause physical complaints. Studies with regard to the design of the PC-mouse by National Taiwan University and Erasamus University Medical Center have resulted in a slightly slanted mouse body as with the HandShoe Mouse to prevent these physical complaints.